An iconic novel dressed in a fierce design by acclaimed fashion illustrator Ruben Toledo. This couture-inspired collection also features Jane Eyre, The Picture of Dorian Gray, Dracula, The Scarlet Letter and Wuthering Heights. Ruben Toledo’s breathtaking drawings have appeared in such high-fashion magazines as Vogue, Harper’s Bazaar, and Visionaire. Now he’s turning his talented hand to illustrating the gorgeous deluxe editions of three of the most beloved novels in literature. Here Elizabeth Bennet’s rejection of Mr. Darcy, Hester Prynne’s fateful letter “A”, and Catherine Earnshaw’s wanderings on the Yorkshire moors are transformed into witty and surreal landscapes to appeal to the novels’ aficionados and the most discerning designer’s eyes. Jane Austen was born on December 16, 1775 at Steventon near Basingstoke, the seventh child of the rector of the parish. She lived with her family at Steventon until they moved to Bath when her father retired in 1801. After his death in 1805, she moved around with her mother; in 1809, they settled in Chawton, near Alton, Hampshire. Here she remained, except for a few visits to London, until in May 1817 she moved to Winchester to be near her doctor. There she died on July 18, 1817. 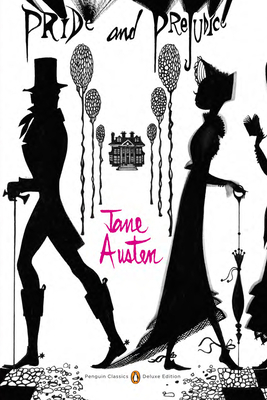 As a girl Jane Austen wrote stories, including burlesques of popular romances. Her works were only published after much revision, four novels being published in her lifetime. These are Sense and Sensibility (1811), Pride and Prejudice (1813), Mansfield Park (1814) and Emma (1816). Two other novels, Northanger Abbey and Persuasion, were published posthumously in 1818 with a biographical notice by her brother, Henry Austen, the first formal announcement of her authorship. Persuasion was written in a race against failing health in 1815-16. She also left two earlier compositions, a short epistolary novel, Lady Susan, and an unfinished novel, The Watsons. At the time of her death, she was working on a new novel, Sanditon, a fragmentary draft of which survives.